This software will provide you with an endless variety of ways to use your embroidery machine so you’ll want to play and play! 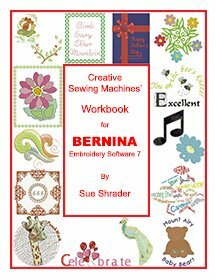 The goal of the workbook for BERNINA Embroidery Software is to make you very comfortable with all the tools of the software by introducing them one at a time until you have used and mastered each one. Each step of the lesson will be detailed with screen captures. This will make it easy for you to see exactly how your screen should look and keep you on track. There will be a red arrow that will point to important features as you progress through the lessons. Take each lesson in order and you will gradually build your knowledge so that by the end of the book you should be comfortable using all the tools in the software. The workbook is made up of over 400 pages and starts with a Getting Ready introduction that is followed by 65 Lessons. The lessons 1-42 will progress through the features that work on both the EditorPlus and DesignerPlus. Lessons 43-65 will be usable only with DesignerPlus. If you only have EditorPlus, you’ll have a chance to see what you can do with DesignerPlus and perhaps decide to upgrade. Description of material covered in the Lesson. First things first: Inserting and saving a design. And then there’s the next thing: Opening and viewing a design. The Tools of Scaling a Design. When BERNINA Software 7 scales a design up or down it doesn’t just make it larger or smaller. It actually adds or subtracts stitches so that the design retains its original integrity. Rotating: Around and round you go…it’s easy with the rotation handles and the tools available on the General Commands toolbar. This lesson covers inserting an embroidery design into the Embroidery Canvas and using 3 different methods to rotate the design on the screen. How to clone a design, select hoops, mirror image a design, and use zoom factors. Mirror Merge play, understanding Grouped and Ungrouped designs, how to use the Polygon Select tool, and creating your own design from pieces of another. Some of the most useful features in Software 7 are the mirror merge tools. The various mirror merge options make it very easy to create wonderful new designs that combine and go way beyond the ordinary. Wreath vs Kaleidoscope. Another dimension of the wreath tool is that it also has a Kaleidoscope function. Opening and using the Color Film Docker, sequencing colors, using Slow Redraw and Stitch Sequencing. Reshaping an Embroidery Object. Insert a design and reshape it so that you can get a feel for how control points work in an embroidery object. This will let you take a design and turn it into a really crazy look. Insert a design and edit a floral design with all kinds of beautiful fill stitches. This lesson will introduce the ALT key as the new star of the grouped design. If you have DesignerPlus software you can digitize the circles and shapes easily with one of the many digitizing tools. However, if you have EditorPlus you don’t have those same options so you need to approach the shapes in a different way. Everyone will benefit from learning to use the Art Canvas and CorelDRAW Essentials V6 to draw a shape and convert it to embroidery that can be edited. Manipulating the layout of fancy and pattern fills is also covered. Lettering at its most basic level. Obviously you can type a word or letters on the screen and send it straight to your embroidery machine. There are a “few” more things that can be done. Reshaping lettering offers numerous ways to manipulate word size, letter spacing, more than one color in a word, more than one font in a word and even separating letters so that a design can be incorporated into a word. Lettering Baselines: Clockwise and Counter clockwise baselines and circling a design. Lettering Fun. Mixing it up. Creating a new path for adding lettering can make a project lots of fun. This exercise uses 3 different lettering fonts, Any shape and Free line baselines, the Polygon select tool and cloning for the fun of it. Monogram Magic. Monogram designing is a wonderful feature of Software 7 in that it makes it possible to combine lettering, ornaments, all types of fill stitches and a wide range of borders together in one operation that takes shape on the screen in real time. Elastic Lettering is a way of stretching and pulling lettering in some fun and crazy ways to create all kinds of special effects. This exercise will let you play a lot with these tools. The example is going to use lots of BERNINA Software 7 icons and tools and perhaps you will want to type in the names of your favorite people, children, husband, hobbies etc. to create your own word collage. Creating a background template to suit your color palette. Buttonholes have never been so easy and professional as having the embroidery module do all the work for us. Being able to digitize buttonholes to use on a variety of projects is very appealing. This exercise will get you started and your imagination will run wild. Buttonhole Treasures. Decorated buttonhole designs are a snap to put together. Selecting fabric backgrounds help you visualize how your designs will sew on fabric. Raster or Vector Graphics…What difference does it make? Explore each type of graphic image format and learn when to use them in Software 7. Auto Digitizing: a Raster or .bmp graphic type file can be inserted into the embroidery canvas or imported through the Art Canvas. The whole graphic can be Auto Digitized, or parts or the whole can be digitized with the Magic Wand. A .bmp file can also be used in PhotoSnap Digitizing. This exercise uses the Auto Digitizing tool, editing, changing stitch angles, color wheel, special effects, and stitch sequencing. Magic Wand Digitizing. The magic wand digitizing feature lets you digitize all of a design object by object with either fill stitches or outlines. You can digitize the whole design or just parts of it. It makes quick work of getting a bitmap image translated into embroidery stitches using thread color settings and assigning Isacord thread color numbers to the default colors, artwork preparation, special effects and careful editing. PhotoSnap gives a very ‘artsy” digitized image of a picture or graphic. The design is made up of one color only and is formed by satin stitches of varying spacing settings. These satin stitches are formed in rows and some appear to be just straight stitch lines. For this exercise we will start with a simple graphic and learn the ins and outs of using PhotoSnap. It really is a “snap” to use. Without getting overly technical about touching up photographs and making lavish preparations for this PhotoSnap, snap a picture and turn it into an embroidered image. Understanding the basics of what it takes to create an appliqué for embroidering in the hoop. Simple applique shapes can be created from the Monogram Program using the Borders feature. Tools used include break apart, rearranging by drag and drop in Color Film, copy, paste, and alignment tools. This exercise opens up a world of possibilities using the character texts that are available through the Artwork Canvas. You will insert a character, convert the vector file into stitches and then through a series of manipulations prepare a blanket stitch appliqué that can be embroidered. You will also create a pattern for the applique shape that can be printed and then traced onto paper backed fusible web. In this exercise, you will cover drawing shapes in Artwork Canvas using the CorelDRAW® Essentials tools and editing the shapes as necessary, converting to embroidery, aligning, spacing evenly, and layout of fancy fills. Use Application Launcher to open Portfolio so that you can view all the graphic and design files easily. Portfolio will only be used for viewing files in this exercise. Other Software 7 features covered are opening artwork, cropping a part of it to digitize, auto digitizing, cloning, sequencing by selects, and color wheel variations. Portfolio will be used to open a graphic and prepare it for converting to embroidery. This exercise also utilizes the easiest way to select just parts of a graphic to digitize, the newest coloring tools available in Software 7, and placing the design on a fabric background. Converting Designs in Portfolio. Save an Embroidery design as a bitmap and turn it into a PhotoSnap! Sometimes a design shows up that you’d really like to have as an image for a greeting card that you want to print, or perhaps as in this exercise, something you would like to turn into a PhotoSnap design. Those steps will be covered here as well as locating the design on an article of clothing so that you can see the full impact of the way it will look when it’s stitched out. Letting the software know what kind of fabric you are stitching on and having it suggest the correct stabilizers can be a real time saver. This exercise will use Portfolio to view images, Import art work into the Art Canvas, Change vectors to bitmaps, Dim artwork when digitizing, use Magic Wand to digitize, create lettering in the round, coloring, showing needle points, moving the start and end points. Converting a drawing straight to embroidery is a great way of getting a design digitized in a hurry. You can only convert to embroidery if you are using a vector image. The Quick Trace available in Art Canvas makes it possible for you to use a bitmap image that is in the software, or that you find on the web, or that you scan into the software and turn it into a vector file. Then you can quickly convert it to embroidery. Application: Cross Stitch. Cross Stitch is one of those hand embroidery techniques that many of us learned as children and that people use throughout their lives for wonderful framed art, pillows, pin cushions, and a multitude of other projects. Software 7 allows you to digitize these crosses and create a lovely piece of art in your embroidery hoop. This lesson will give you an introduction to the digitizing of cross stitch embroidery. More Cross Stitch. Quickly digitize a graphic with the cross stitch application and type cross stitch lettering directly onto the screen. Convert Embroidery to Cross Stitch. Take an existing embroidery design, open it in the Cross Stitch application and have a cross stitch design. Use more Cross Stitch tools to create another sampler. Creating a cross stitch design from a bitmap image. Any bitmap image that is in color can be opened in the Cross Stitch Picture mode and then digitized with the Magic Wand tool. Application: Quilter. Welcome to the wonderful world of Quilt design made possible by the BERNINA Embroidery Software 7. Whether or not you consider yourself a quilter you will love using the Quilter program. With it, you will be able to see exactly how your quilt will look before you begin cutting. This lesson will introduce you to the basics of the Quilter Program: Setting the block size, sashing, and borders; choosing a quilt block, adding fabric choices and exploring the print options. CorelDRAW Essentials X6 is a part of Software 7. This exercise introduces more basics on using CorelDRAW Essentials X6. You will open a bitmap image in Art Canvas and touch it up using Corel PHOTO-PAINT Essentials X6 Tools. You will bring the graphic image back into the Embroidery Canvas and auto digitize it. Color Palette: Customizing the thread chart for one or all your designs is a pretty simple task in the software. There are 56 BERNINA colors in the palette that open up each time you open a new page. You can change those colors to whatever brand you would like to use and save them to a template so they are always there. This exercises explores the many ways you can work with the thread colors. Using Portfolio to convert embroidery designs from one file type to another. This exercise will use the Cross Stitch Application to create a border and then insert a nice quote that could be used as a greeting card, a rug mug, or something sweet for a friend. The lettering will come from the new Software 7 running stitch alphabets. DesignerPlus only lessons begin here. This exercise offers a very basic introduction to Manual Digitizing with the Open and Closed Objects and Outline stitches. Manual digitizing, Hole cutting, hole filling, Pattern stamp, Step fill variations. Block Digitizing, Double Run, Traveling stitches, Measuring, Ellipse digitizing, Raised Satin Fill, Cloning, and more. In this lesson you will digitize a simple shape to get the feel of what the Auto Appliqué feature in Software 7 does. Use CorelDRAW Essentials X6 Text files…Webdings for some great choices of shapes for appliqué. Digitize with the Rectangle Tool, use Remove Overlaps, digitize with the Block and Ellipse tool, use the new Flair Alphabet, Step fills to add dimension, and a Carving Stamp application. The color film option of hiding parts of the design will be heavily used. Advanced applique. The technique offers the ability to digitize not only closed shapes but also open shapes that the software will transform into appliqué. Copying CorelDRAW Essentials X6 Clipart folder to My Designs-Embroidery Software 7. Converting a vector image to embroidery and using Raised Satin Fill. PunchWork, Auto Digitizing, Blackwork Run, Stemstitch. This exercise will give use two methods of using the Punch tool. In the first part of the exercise you will use an existing design and change part of it to PunchWork. In the second part, you will digitize your own PunchWork design. Another of the special effects that 7 offers is the Raised Satin outline and fill stitch and the ability to create Trapunto outlines so that you get the true effect of stuffed Trapunto. The best part is that the stitches of the embroidery form the filler for the Trapunto so there is no cutting into the fabric back and stuffing with batting or fiber. This exercise will use these features and incorporate adding holes and software generated stippling. Use your embroidery machine to sew over wire to create pieces of embroidery that actually are raised off the base design. This lesson covers the basics of using both the StumpWork Toolbox and The StumpWork Docker to digitize a StumpWork Design. Go through the steps from drawing the shape, to digitizing a flower petal, to sending the designs to your BERNINA to stitch. StumpWork created from an existing design. Intertwined shapes and special effects. Drawing and reshaping, using the wave effect, travel on edges, outline design. One of the most interesting designs in the workbook. Creating a Large Embroidered Quilt Block. This exercise uses lots of tools: Blackwork run, Digitizing tools, Mirror Merge, Arrange, Locking design, creating a block template, Monogram, Polygon Select, Color Palette, Color Wheel, Creating a Pattern Stamp, Digitized Stippling. This Multi-Hooping lesson covers the breaking apart of a 12” square embroidered quilt block. You select the pieces that will fit in the hoop and split them by selecting those areas, cutting the pieces apart, and creating 3 separate hoopings. You then print each of the designs to use as templates for hooping. You will also spend some time arranging the colors in a way that will reduce the number of color changes required. The Hoop Canvas allows you to use a bigger design than will fit in your hoop. This exercise covers using a design created in the workbook that is larger than the oval hoop. The Hoop Canvas is used to break apart the design, create a design for each separate hooping and add reference marks so you can line up the design easily when stitching out. BERNINA Software 7 brings us 4 new small Alphabets. These are especially designed to be able to sew out in much smaller scale than we have been able to do previously. Learn about the particulars of these new alphabets. Touching Up Artwork inserted into the Embroidery Canvas. Color Blending: this lesson covers color blending, contour fill and adding stitch angles. Texture from Star Fill Effects. The texture can be achieved without spending a lot of time changing stitch angles and fill types. This lesson uses the star effect and the Mirror Merge Wreath tool and raised satin ellipse. Using the Carving stamp with lettering and patterns creates unique effects. So many possibilities of things you can create from the shapes you can draw in Art Canvas with CorelDRAW Essentials X6. Let’s have a sampler party and create some fun things. All the shapes you will draw are vector images and be converted directly to embroidery. Lots of tools: Blackwork run, Digitizing tools, Mirror Merge, Arrange, Locking design, creating a block template, Monogram, Polygon Select, Color Palette, Color Wheel, Creating a Pattern Stamp, Digitized Stippling.